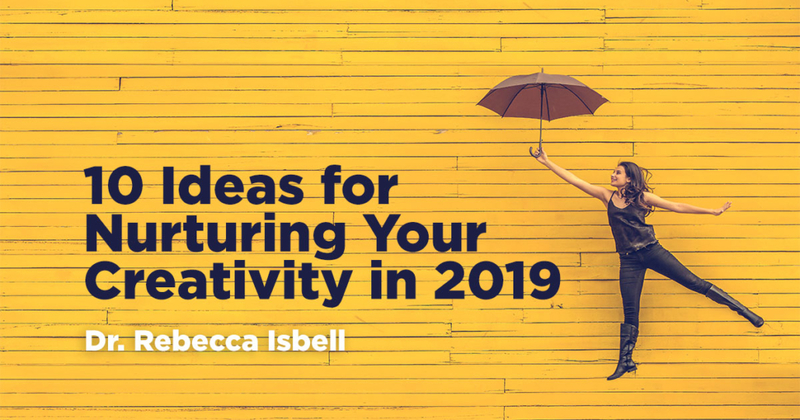 As we move into 2019, we have the opportunity to think about this New Year and decide how we can nurture our own creativity. In all aspects of our lives we can stretch our thinking, try new things, and find joy in the small happenings. Notice the beautiful things in your world: Succulent plants, 3D-art or sculptures, a pattern in a scarf or wall hanging, a bow in a child’s hair, and the shining stones during a walk. (So many beautiful things if we take the time to see!). Carry a “thinking journal” with you wherever you go: Each day hundreds of ideas and possibilities fly though our conscious mind—only to be last forever because we have not documented it. If you have a small notebook or journal with you it makes it possible for you to catch and keep the idea! Wear something you have never worn before: Patterned socks, a unique hat, a brightly colored stole, or something in your closet that you thought were so beautiful, but you never had the courage to wear it. Create a quiet place in your environment where you can read, think, listen to music, or meditate. It can be a tiny, tiny space but it should contain things that you love and bring you joy. Of course, you need a comfortable place where you can lounge. Make it a habit to visit this quiet place every day. Read a book, blog, or article that will stretch your thinking: Perhaps a new topic or something you have always been interested in but couldn’t find the time to explore. Reflect on your day: At the end of your day, when things have finally quietened down, reflect by focusing on moments and events that were special, made your heart sing, and built your creative confidence. Find time to play with children, family members, or colleagues: Play is intrinsically motivating, and it allows us the freedom to try new ideas without fear of failure. After all, play is pretending, imagining, and exhilarating. Reconnect with a friend, colleague, or relative that has a positive attitude and has many amazing ideas. Collaborating with a creative person will ignite new ideas and possibilities for you. Brainstorming with others often produces a path to opportunities that you might not have generated on your own. Identify music, recordings, stations, and instruments that lift your spirits and inspire you. Listen to these when your spirits are down, or when you are thinking of having a “pity party.” Sing along, tap your toe, or just enjoy listening. Recognize that you are a Creative person filled with amazing ideas and unique opportunities. When something occurs that reminds you of your creative capabilities, treasure it, write it down, and celebrate your special talent. As we work with young children and colleagues each day, we are demonstrating what an innovative thinker looks like. We model behaviors that show creative thinking, and we gain confidence in our creative abilities. May 2019 be filled with Creativity and Joyful Learning!